Sweet squash paired with walnuts and pureed till velvety smooth! 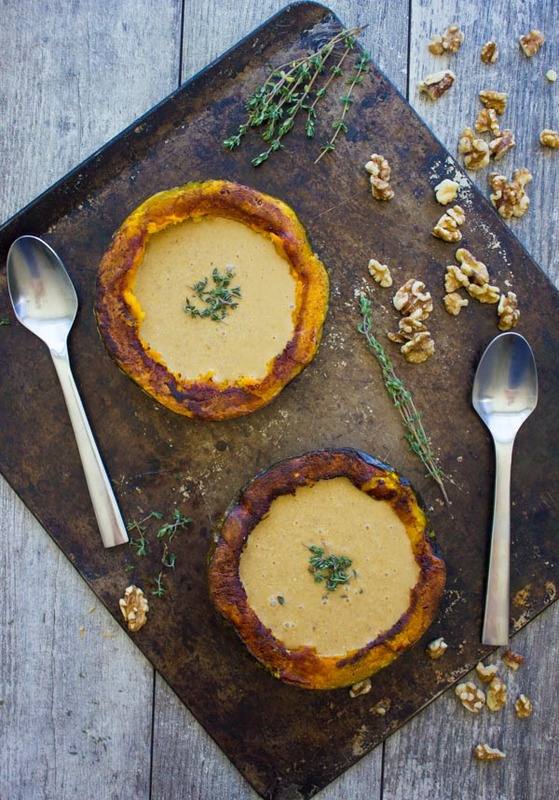 This Walnut and Squash Soup is the perfect warming comfort food! 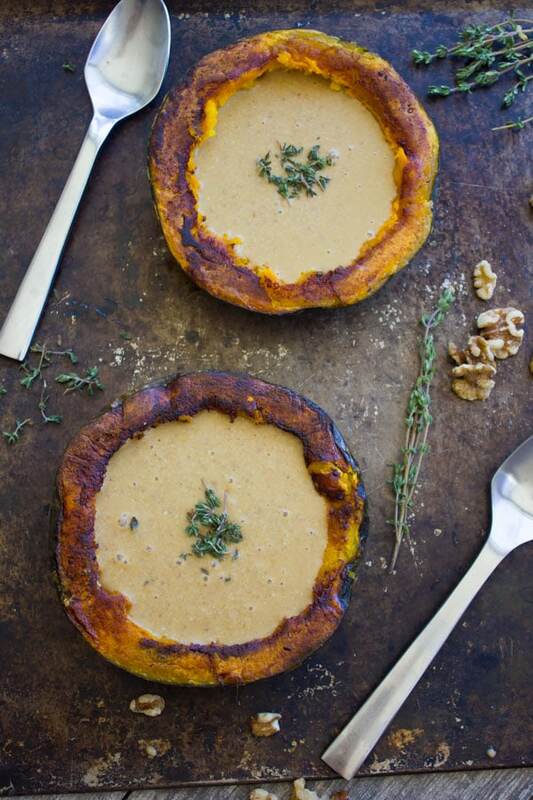 Serving this vegan squash soup in roasted squash cups takes this fall soup to the next level. 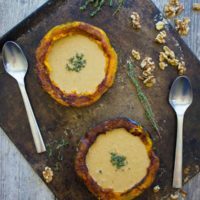 It’s feeling like soup this time around, and I’m talking velvety smooth creamy Walnut Squash Soup in Squash Cups. A soup that’s packed with the goodness of veggies and walnuts, Hearty, filling and totally vegan. There’s something about cold weather food, something so comforting that you can’t replace. 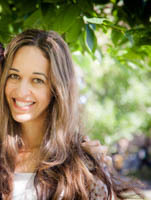 I never forget those years I lived in beautiful Miami, weather was gorgeous all year long. There were days I used to crave this comfort and make soup, but it never felt the same. Well, today this vegan squash soup was perfectly fitting, a windy rainy day, the start of fall, and the cozy feeling of staying home watching TV. And this vegan soup with sweet kabocha squash and walnuts is particularly special because it’s one of my mom’s favorites. If you’ve been to Vienna, you would’ve noticed (among many other beautiful things!) the walnut trees everywhere in residential areas. I remember we used to take walks around our neighborhood, and with the beginning of Fall, we’d see those lovely walnuts falling off the trees everywhere. There’s something about eating fresh walnuts right off the trees that we loved, especially my mom. She has a thing for walnuts everything, desserts, ice cream, walnut sauces, and this walnut soup. So we used to pick some of those fresh walnuts, break up plenty of shells and make this creamy dreamy walnut soup. The only difference is today I’ve added squash so it’s a walnut squash soup. The oven-roasted squash adds a nice thickness and creaminess to the walnut soup which made it easy for me to skip the cream (sorry mom!) so it’s a vegan squash soup. Also, the squash adds a hint of sweetness which compliments the walnuts beautifully. And while I used the roast kabocha squash, I didn’t throw away the shells—I used them to serve up the walnut squash soup! So I’ll quickly run this recipe for you. Just slice your squash in half and remove the seeds. 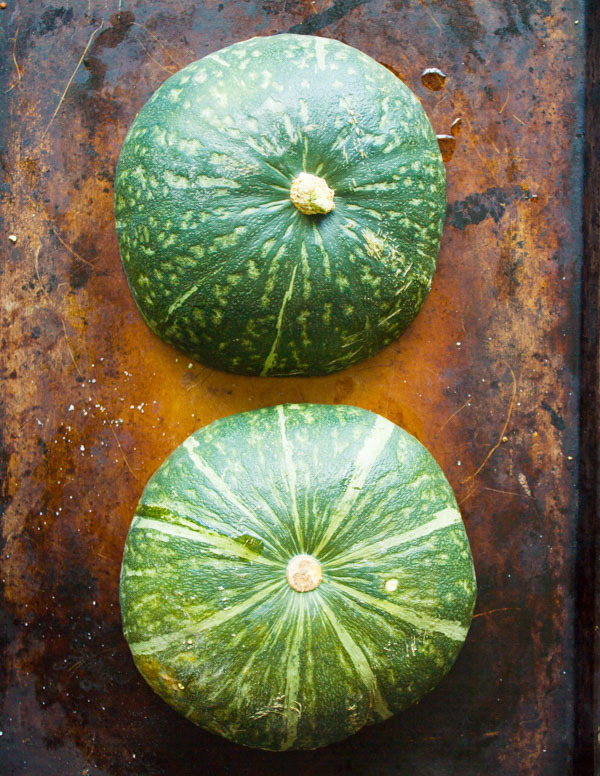 Season the inside of the squash and place it cut side down on a baking sheet to roast. When they’re done, you’ll simply scoop out the flesh using a spoon while keeping the shells intact. Add the scooped out squash to the walnut soup, cook for 10 minutes and blend the soup. I’ve used nuts in other soups before. If you like this combo as much as I do, make sure to check out this cauliflower hazelnut pear soup and this artichoke soup with pistachios. 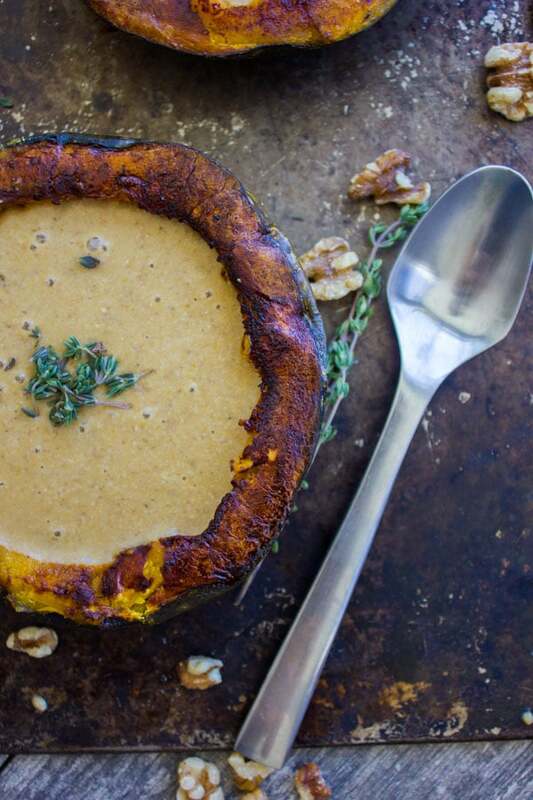 This vegan squash soup recipe would work perfectly well with pecans or hazelnuts. Rolled oats serve as a gluten-free thickener in this recipe, so don’t skip them. 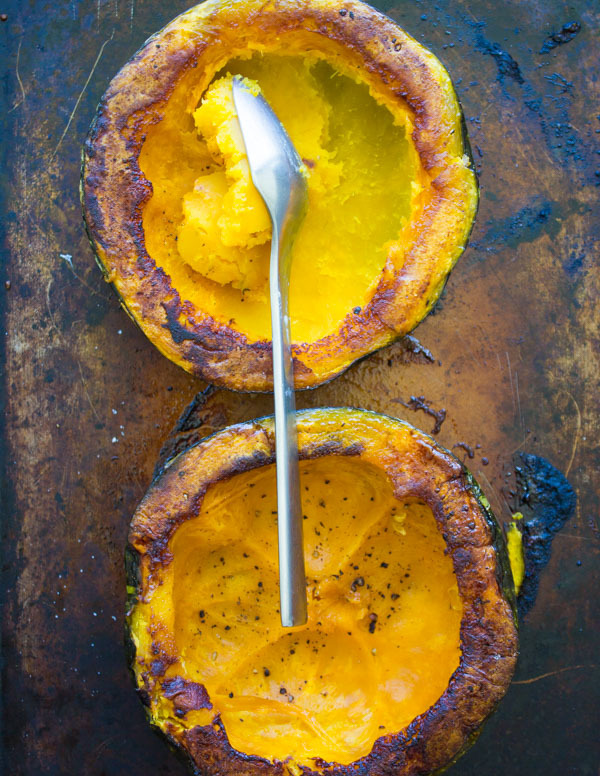 I used kabocha squash for this recipe but acorn would work just as well. 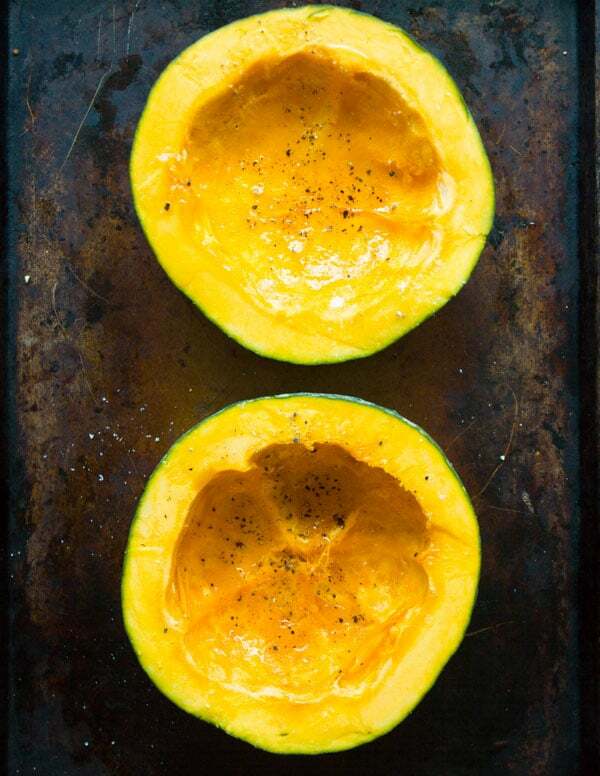 Season the inside of the squash with salt, pepper and olive oil. 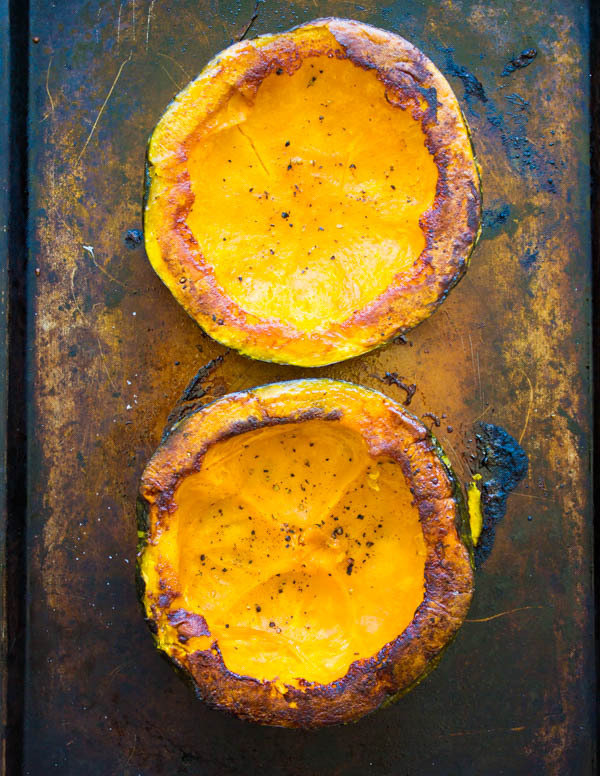 Place the squash on a parchment lined baking sheet with the cut side down, and roast for 20 minutes until the flesh is tender. In the meantime prepare the soup. In a pot, sauté the onion and bell pepper with the olive oil over medium-high heat until soft. Add the salt and oregano and sauté until the onion starts turning golden. Add in the garlic and sauté. Add the oats, the walnuts and keep sautéing for 2 minutes until they’re toasty. Add in the broth/stock and increase the heat to high. Cover the pot and bring the soup to a boil. Lower the heat back to medium-low and let the soup cook for about 20 minutes. Using a spoon, scoop out the flesh of the squash without disturbing the shell of the squash (so it stays intact), and add the squash into the soup. Cook the squash in the soup for 10 more minutes. Transfer the mixture to a strong blender (I used my Vitamix) and blend until smooth. Taste and adjust seasoning with salt and pepper. 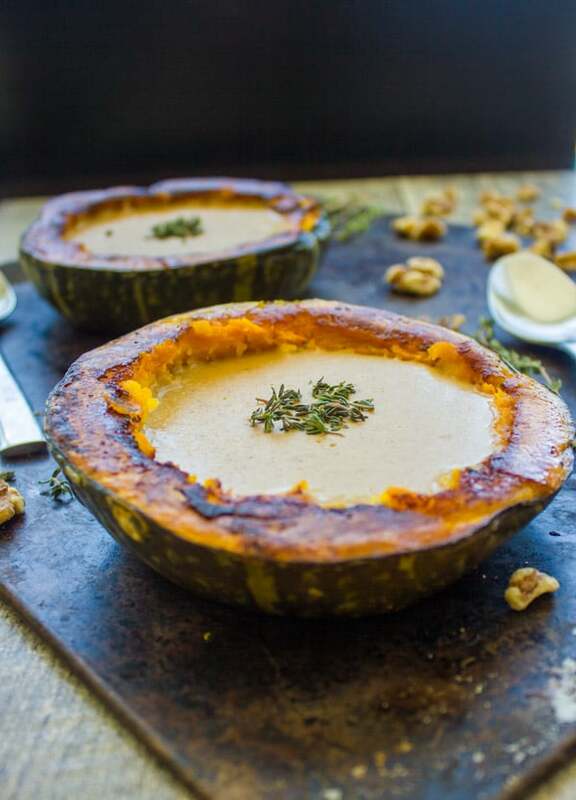 Serve the walnut soup in the squash cups and enjoy! Rolled oats serve as a gluten-free thickener in this recipe, so don't skip them.